Microsoft not only released a version of OneNote for the Mac OS X, they made it free as well. It is free not only for the Mac, but for all platforms. There is still a business edition that is a paid for product, but all of the rest are completely free. I have downloaded and installed the Mac version, but have not yet used it, so I cannot yet compare it, but from what I have seen, it looks and works just like its Windows counterpart. Finally, our Apple friends can now use what is, perhaps, the greatest piece of productivity software ever to come out of Redmond’s software factory. Not only did Microsoft make OneNote available for free, they have added features. An improved API, LENS for Windows Phone (which turns the phone into a scanner), enhanced the OCR ability and released a library of plug ins. Go here for a list of apps and services that work with OneNote. With OneDrive, you can now keep all of your Notebooks in sync. You can even protect your notebooks and all of the various versions (except for the Windows Store version) will be able to access the protected notebook. Even the web version. Yes, you can even use the web version with YOUR notebooks. I am a huge fan of this software and have written several posts about it. Click here to check them out. OneNote is available for Windows, Windows RT, Windows Phone, Android, iOS and, now, Mac OS X. You can download the package for your device here. Microsoft’s developer’s conference, Build, began with the keynote from Steve Ballmer. Ballmer began by talking about hardware, new phones and tablets (there will be an 8 inch form factor, beginning with Acer) but quickly got into Windows 8.1, which was released today in a preview build. Among the changes, a more functional Start button that includes the ability to shut down the computer-something that was a complete surprise. Also in the build, the boot to desktop-another feature we didn’t think would make it into this build. There were tons of goodies either shown or talked about. They include a Windows 8 style Office release for 2014, Outlook for Windows RT that looks really, really nice. A new version of OneNote is also in the works. XBOX Music is not only gaining a cloud version, but has been completely re written and includes RADIO, a free streaming service. It, too, looks good. Perhaps the biggest surprise was from Bing. 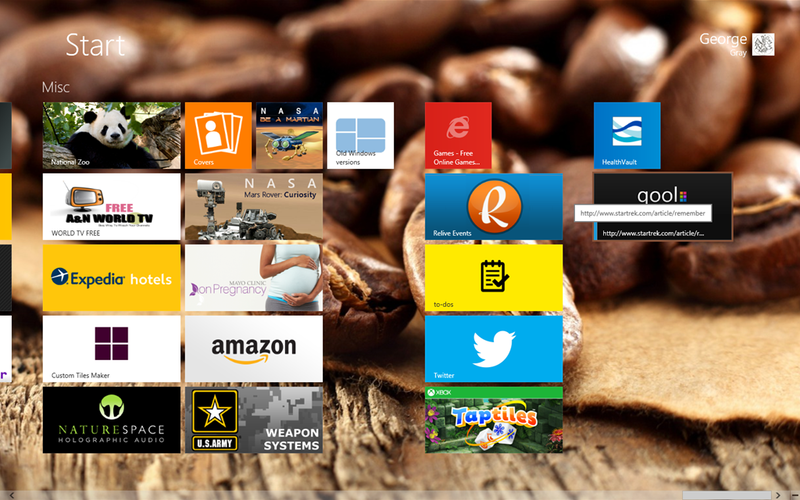 Bing is now the in-built Windows search engine. Not only that, but Microsoft has released a set of tools for developers that gives them very tight integration with Bing. This, to me, is probably the biggest news yet, from Microsoft. Another surprise was an announcement from Dell that they will be selling a Windows RT tablet, giving credence to the notion that Microsoft has not abandoned the struggling operating system. Sprint is, finally, going to be carrying two Windows Phone 8 devices, one from HTC and the other from Samsung. Two other announcements of note: Windows 8.1 includes built in support for 3D printers and high resolution, retina like, displays. I’ll have more on the preview once it is installed on my tablet. While I am a huge OneNote fan, I use it everyday, I am always on the lookout for a decent or even a superior competitor. Evernote comes close, even in its sub-par form today. 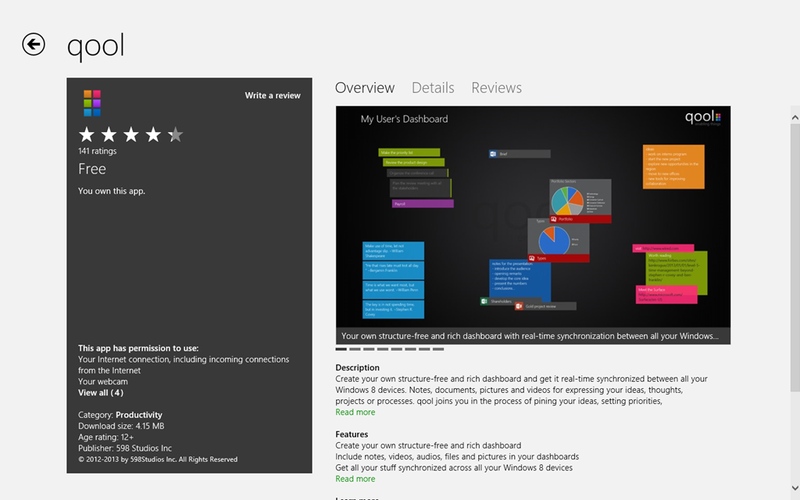 Windows 8 has ushered in a new set of applications, including a slate of OneNote like applications. The latest I have seen is called Qool. Qool is really more of an organizational tool than a note taker like OneNote-it does not have a complete set of editing tools like OneNote-but it has many basic features that make it more than usable AND…it has a tremendous sync tool. When comparing features, it has most of the core set: embed audio, video and photos; note taking; embed other filetypes; organize your notes and present them in one of many ‘dashboards’. What’s lacking are all of the editing features. I’ve not found any way to bold text, change fonts, or any of the formatting features found in other similar applications. To create a note, simply double click or tap and a blank note appears. Type your text and then press ENTER. Viola! Your note is saved. Like OneNote, there is ‘SAVE’ button, changes are saved on the fly. Right click or swipe up and you reveal context sensitive menus. The basic menu lets you change the current notes backcolor; Pin to start; Organize; Remove; Clean; Upload a file; record audio or video or take a picture. Organize gives you several preselected layouts for your notes and files. Clean removes selected items. Remove removes the selected item. 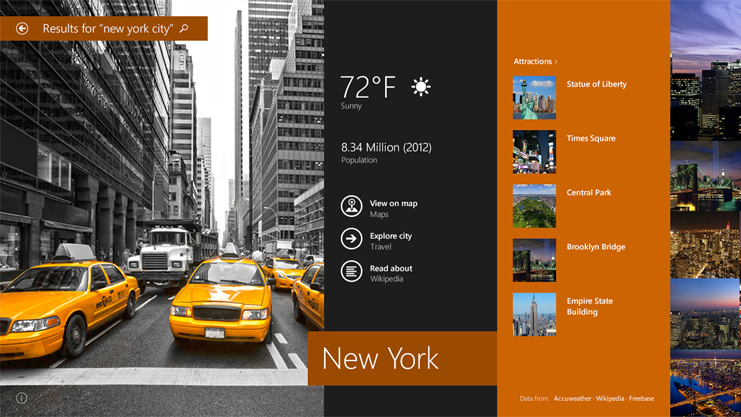 Pin to Start creates a tile on your Start Page that will take you directly to your note. 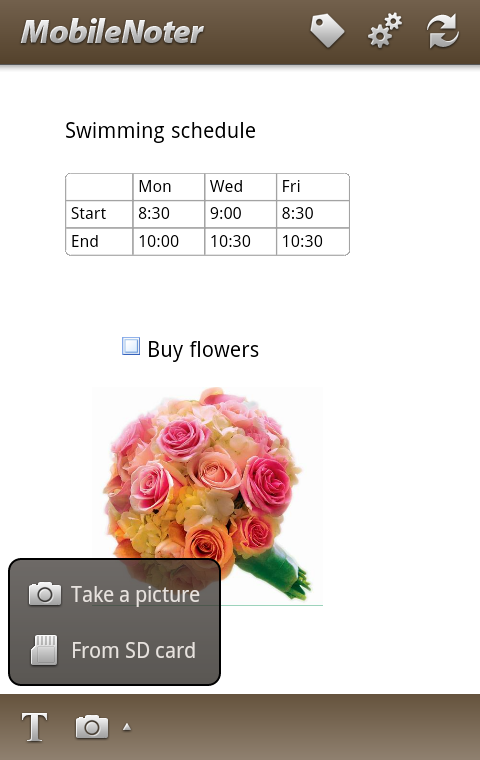 Other context menus allow you to select your Dashboard layout, change your note color and more. 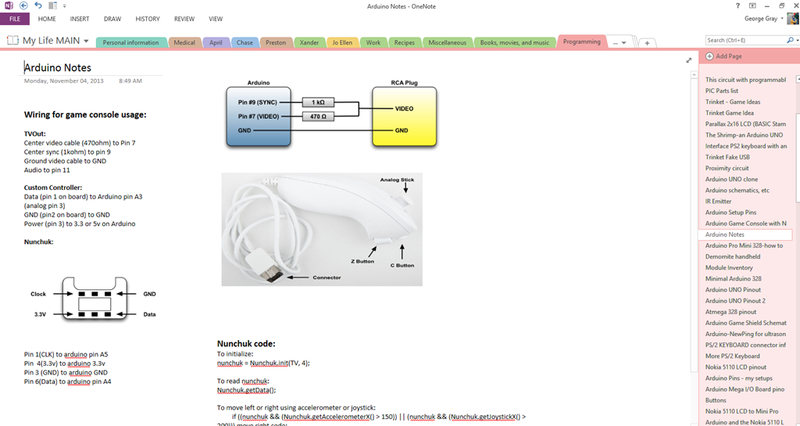 Dashboard is simply a nicer way to present your dataset. 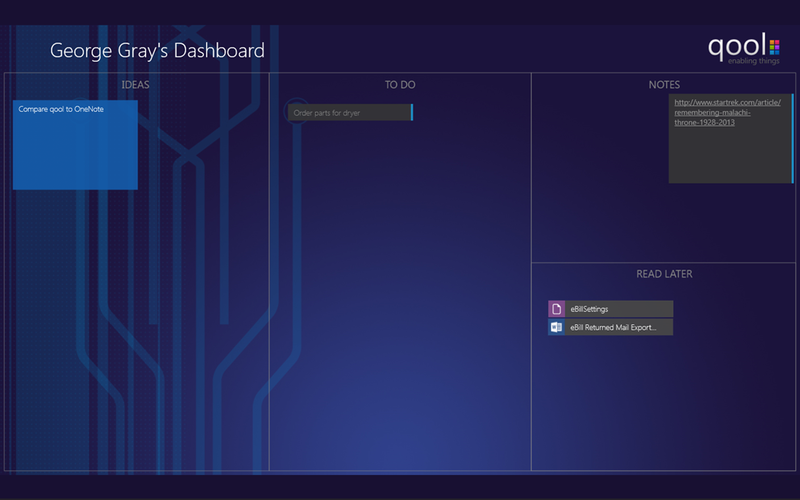 Whereas OneNote is more of a database with various notebooks, QOOL is more of a project management tool. When a note is no longer needed, you clean to remove it (or them, depending on how many you have.) So, being abl e to present your notes and items in an organized fashion is a huge plus. There are several pre-selected layouts, but you can create your own. The big feature, though, is the sync. I have the trial version installed on three machines. I could make a change on one of them and the change would show up, almost instantly, on the others. Very nice, indeed. 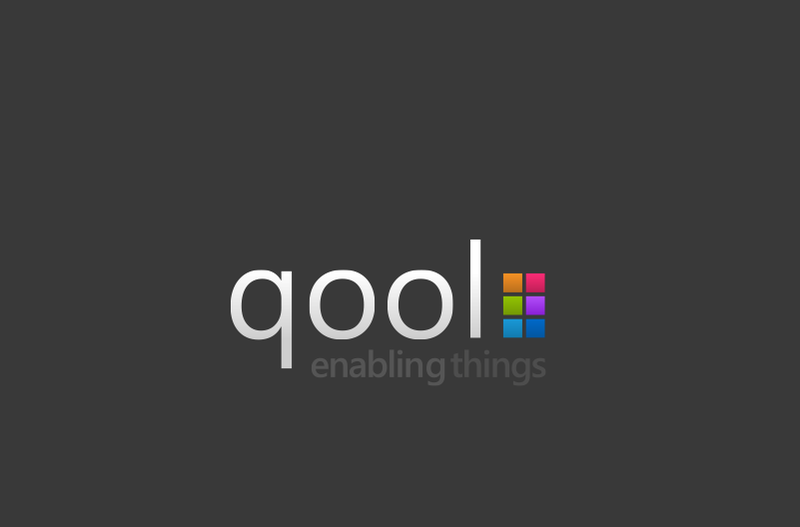 While OneNote need not quiver in its boots, I see that QOOL not only has some use, but could be a great adjunct to OneNote or even Evernote. I will be using to product, which is currently free, and will be reporting back on how well it works, so stay tuned! Qool is from 598 Studios and is available in the Windows App Store. Open the store, click the Search charm in the charms bar and search for Qool. it works, it is lacking in many features that make OneNote so great. Notebooks with your iDevice. The application worked very well. 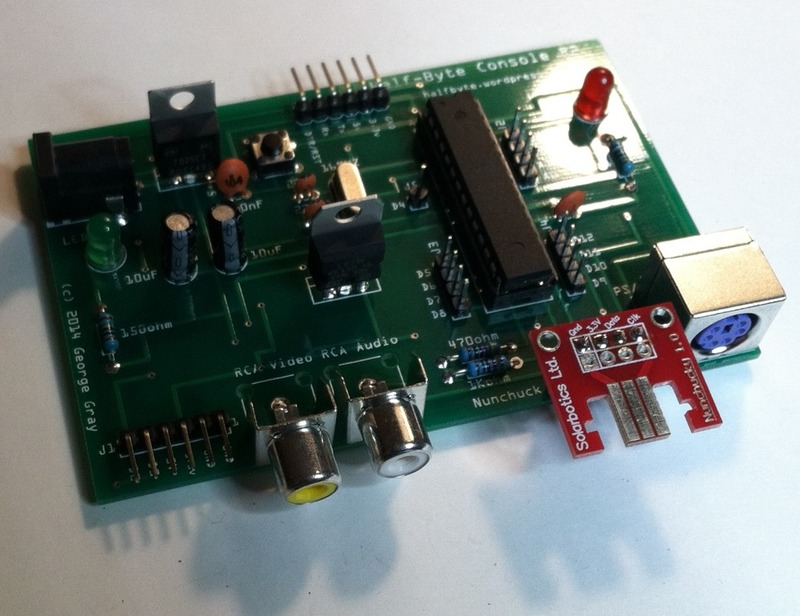 client and the awesome Ever2One converter. First, the Android client works very much like the iDevice counterpart. tremendous way to get your OneNote Notebooks onto your Android device. the easiest way to do that. 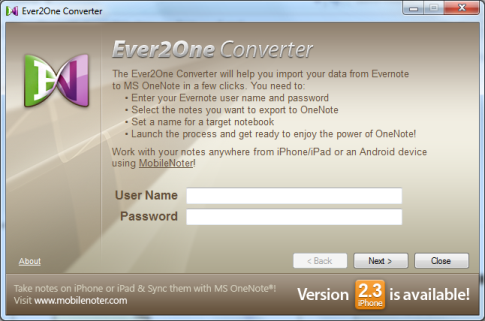 heavy OneNote user, this software is a must.